Eddie Jones watches over his squad's session at Pennyhill Park. AND SO IT begins; verbal and psychological warfare for the next five days. We don’t expect anything else from Eddie Jones, the England head coach, particularly in this week of all weeks as his team chase a world record 19th win and a Grand Slam in Dublin. 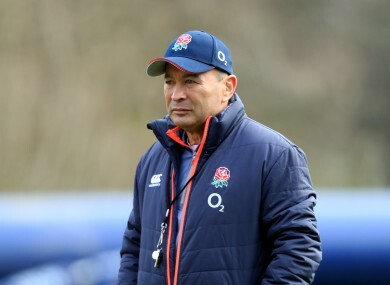 Speaking at England’s base in Pennyhill Park, Bagshot, Jones insisted his team did not celebrate the clinching of the Six Nations title on Saturday after their 61-21 victory over Scotland. “We didn’t celebrate. We haven’t got anything to celebrate yet,” he said. “It is all ahead of us. Last year we were nervous and I expect us to be nervous this year. It is a big occasion. “You don’t get a chance to win a Grand Slam back to back too many times but experience helps. The players have experienced that the year before so I’m sure they will cope with that. “Every year winning is difficult. There’s a perception that this Six Nations has been better and it probably has been, but you’ve still got to win and to win it you’ve got to stay undefeated. It’s the second consecutive year England have secured the championship crown with a game to spare as they strolled to a record-equalling 18th straight win at the weekend. They now have the chance to complete back-to-back Grand Slams in Dublin, a feat no team has managed to achieve since France in 1997 and 1998 when the tournament only had five teams. Although Ireland’s title hopes are now over, Joe Schmidt’s men are the side that can prevent England from making history at the Aviva Stadium on St Patrick’s weekend. “Ireland are an extremely well coached side and they’ll be grossly disappointed by their performance on Friday,” Jones added. “I’ve just been reading all the predictions at the start of the tournament and a number of people tipped them to win the competition. England are monitoring the fitness of winger Elliot Daly ahead of final game of the campaign. Daly suffered concussion after a dangerous dump tackle from Fraser Brown, who was cited for the incident. Email “'Ireland were favourites but they haven’t won the Six Nations': Jones begins mind games”. Feedback on “'Ireland were favourites but they haven’t won the Six Nations': Jones begins mind games”.